New Shower Head Generates Its Own Light! New for August 2014, what could be more relaxing than showering under an invigorating spray of sparkling water with light dancing off the drops as they fall? Crosswater has made the dream come true with Dynamo, an innovative new shower head that incorporates LED lighting to illuminate your shower. The head is a polished 300mm half dome with LED lights around the edge. The LEDs are powered purely by the force of the water so there is no need for connection to the mains, avoiding the need for compliance with the IP regulations. It is designed for wall or ceiling mounting and can be combined with any Crosswater concealed high pressure shower valve. 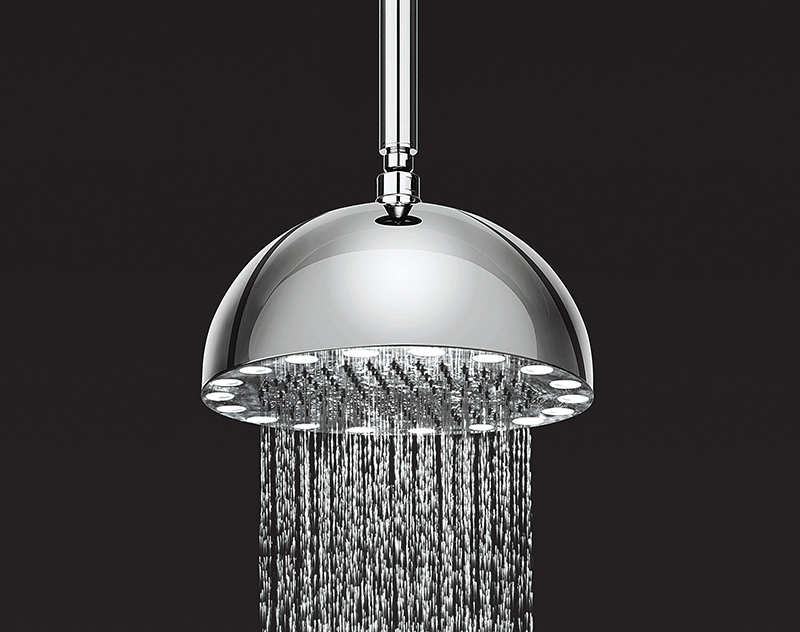 Introducing lights to a showerhead adds a real dynamic, says Crosswater Chairman David Hance. The technology used to create the Dynamo head makes achieving the effect safe and simple – and reduces the cost of installation as there is no need to employ a Part P compliant electrician to do the job. Dynamo is a stunning feature in any walk in shower or enclosure.